This prayerbook's small size speaks of its function as a personal devotional aid. Like other contemporary prayerbooks created in the Anglo-Saxon kingdom of Mercia during the late 8th and early 9th centuries, it is made up of gospel extracts and prayers which centre on a theme, in this case the life of Christ. It resembles other books associated with Worcester, but inscriptions in the back of the book reveal that by the late 9th century it had travelled to the nunnery at Winchester (Nunnaminster). Not surprisingly feminine word endings suggest that at least one of its owners was a woman. It may have been given by Ealhswith, wife of Alfred the Great, whose name appears in the inscriptions, but this theory is unproved. 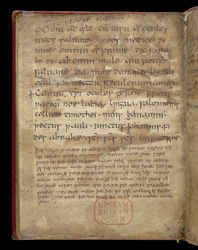 This page, in a section of the manuscript which contains prayers of Irish origin, presents an incantation against weak eyesight: '...give light of the eyes to me.' Near its end, it calls upon the body parts and qualities of saints and Old Testament figures ('the tongue of Solomon, neck of Timothy, mind of Benjamin ...') and ends with the trisagion, 'Sanctus, Sanctus, Sanctus.' Below it is a late 9th- or early 10th-century inscription in Old English concerning the gift of property by its founder, Ealhswith.